We have finally put our too hot and too dry summer behind us. 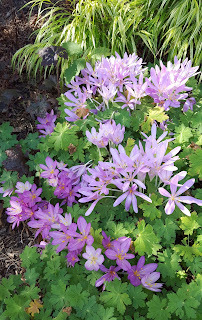 And although the plantings at the park have suffered, today's visit offered a cheerful surprise of beauty in the form of the blooms of Autumn Crocus, a.k.a. Colchicum. 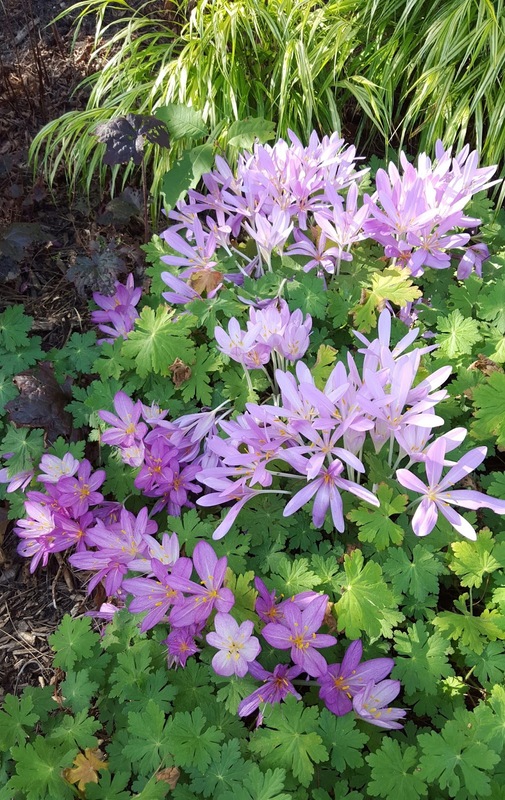 These look similar to early spring flowering crocus bulbs, but the blooms are a bit larger. Unlike crocus grassy foliage, Colchicum puts up broad strappy leaves in spring which go dormant by summer. And, the naked flower buds reemerge in September. They won't last too long but enjoy them if you visit soon. There are two patches: one along the McCallum St sidewalk, the other left of the shed below the Beautyberry shrub. Be sure to notice the handsome purple berries on that shrub, another early fall highlight!